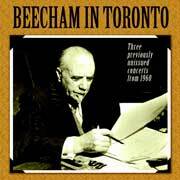 Beecham in Toronto - Previously unissued concerts from 1960. Sir Thomas Beecham cond. CBC Symphony Orchestra Toronto, 3 & 7 April, 1960: Haydn – Symphonies, No. 102 in Bb & No. 94 in G, “Surprise”; Mozart – Symphony No. 38 in D, K. 504, “Prague”; Handel/Beecham – Love in Bath Ballet Suite; R. Strauss – Love Scene from Feuersnot, Op. 50; Brahms – Symphony No. 2 in D major, Op. 73; Beecham cond. Toronto Symphony Orchestra 5 April, 1960, CBC Television Broadcast [audio portion only]: “Lollipops”: works by Suppe, Sibelius, Massenet, Saint-Saëns, and Rossini, introduced by Sir Thomas; interviews with Leon Goossens & Neville Cardus. BONUS CD: Beecham cond. Royal Philharmonic Orchestra. Live – 25 Dec. 1958 BBC broadcast: Mozart – Symphony No. 35 in X, K. 385, “Haffner”; Live – 4 Nov. 1959 BBC broadcast: Wagner: Meistersinger - Prelude to Act I & Delius: North Country Sketches; Live – 25 Oct. 1959 BBC Broadcast: Lalo – Symphony in g.
Audio restoration (2011) by Lani Spahr [discs 1-3] & Kit Higginson [disc 4]. ADD. Timings: CD 1 – 72:00; CD 2 – 69:11; CD 3 – 69:56; CD 4– 76:26.